1910 Gilliss Press ALICE AND I OR LEARNING TO SAIL A BOAT 25 copies 26 pp. 5" x 8.25"
1913 Gilliss Press ALICE AND I, AND ALICE Q AND HER RIVALS 50 copies 46 pp. 5" x 8.25"
1915 Gilliss Press ALICE AND I AT LARCHMOUNT 50 copies 29 pp. 5" x 8.25"
1921 Gilliss Press ALICE AND I ON THE CRUISE OF THE NEW YORK YACHT CLUB 1921 50 copies 42 pp. 5" x 8.25"
1922 Gilliss Press ALICE AND I DOWN EAST 75 copies 38 pp. 5" x 8.25"
1923 Gilliss Press ALICE AND I GO CRUISING AGAIN 125 copies 37 pp. 5" x 8.25"
1924 Gilliss Press ALICE AND I GO DOWN EAST AGAIN 125 copies 47 pp. 5" x 8.25"
1925 Gilliss Press ALICE AND I AND NOURMAHAL 125 copies 42 pp. 5" x 8.25"
1926 Gilliss Press ALICE AND I ON THE CRUISE OF 1926 125 copies 40 pp. 5" x 8.25"
1927 Gilliss Press ALICE AND I CRUISE TOGETHER ONCE MORE 125 copies 39 pp. 5" x 8.25"
1928 Gilliss Press ALICE AND I AND COLLEEN 150 copies 47 pp. 5" x 8.25"
1928 Gilliss Press HOW I WENT TO EUROPE IN THE YEAR OF GRACE 1928 … 30 copies 108 pp. 5" x 8.25"
1929 Gilliss Press HOW I AGAIN WENT TO EUROPE IN 1929 35 copies 94 pp. 5" x 8.25"
1930 Gilliss Press HOW I WENT TO EUROPE IN THE YEAR 1930 WITH THE PROFESSOR 45 copies 102 pp. 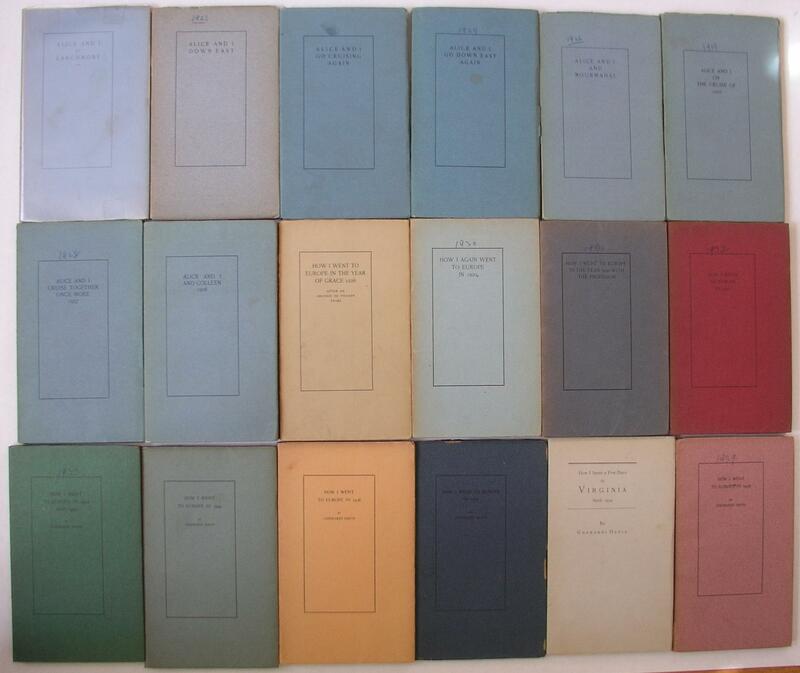 5" x 8.25"
1931 Gilliss Press HOW I WENT TO EUROPE IN 1931 50 copies 101 pp. 5" x 8.25"
1933 Plandome Press HOW I WENT TO EUROPE IN 1932 AND 1933 50 copies 94 pp. 5" x 8.25"
1935 Plantin Press HOW I WENT TO EUROPE IN 1934 50 copies 71 pp. 5" x 8.25"
1936 Plantin Press HOW I WENT TO EUROPE IN 1936 None Stated 67 pp. 5" x 8.25"
1937 Plantin Press HOW I WENT TO EUROPE IN 1937 None Stated 35 pp. 5" x 8.25"
1938 Plantin Press HOW I WENT TO EUROPE IN 1938 None Stated 67 pp. 5" x 8.25"
1939 Plantin Press HOW I SPENT A FEW DAYS IN VIRGINIA APRIL 1939 35 copies 39 pp. 5" x 8.25"
1940 Plantin Press WHAT I DID FROM 1858 TO 1875 50 copies 62 pp. 5" x 8.25"
All titles were issued in softcover wraps. Some have been seen with a glassine jacket. Some have been seen in quarter leather. Many have been seen with spine deterioration of the cover. The bibliography does not include all known titles. 1907 Gilliss Press THE GOSPELS, BY A LAYMAN unknown 40 pp. 8 vo. All titles were issued in softcover wraps. Many have been seen with deterioration of the cover in the spine area. The bibliography does not include all known titles. Born 1858 in San Francisco; married in 1894 to Alice King, the daughter of John & Helen King & of Great Neck NY, died March 9, 1941 in NYC.